The Boat Central project will include 775 feet of cueing docks. Proposed dry boat storage building in Marina del Rey met with local opposition. MARINA DEL REY — To build or to not build a 345-slip dry dock boat storage above federal waters in Marina del Rey: that was the question at the heart of a public meeting held at Burton Chace Park Community Center on May 10. The U.S. Army Corps of Engineers is proposing to build a new on-water structure – called Boat Central – to support a new boat dock system and dry stack storage. It would be an overwater structure with 755 feet of cueing docks. The applicant is Thomas Hogan of MDR Boat Central LLP; the company is based in Newport Beach. Plans also call for a County Sheriff’s maintenance facility, customer lounge, restroom area, 134-space parking lot, public promenade and park, according to a California Coastal Commission staff report issued to commissioners in 2015. “The developer said the project would be integral to expanding boating opportunities, that it provided the most efficient means to boat access, would offer additional waterside facilities, reduce boat maintenance costs and increase access to the water,” said Greg Fuderer, a public affairs specialist with the Army Corps of Engineers. About 50 people attended the May 10 meeting, with 20 members of the public expressing opposition to the project and only the developer advocating in favor of Boat Central. Jon Nahhas, a local boating advocate, sent out video, roughly 2 minutes long, in a mass email on May 9, asking people to attend the May 10 hearing and oppose the project. Marina del Rey boater Hans Etter said the local community and county officials have long been at odds on the proposed Boat Central project. A website advocating against “over development” in Marina del Rey stated Boat Central, if built, would impact water quality, boat launch ramp operations and view corridors. This highly controversial project has been languishing for over 13 years since it was first proposed and is still years from happening. MDR has changed dramatically over this time and sufficient boater demand for this type of facility no longer exists; especially in light of the tremendous number of vacant wet slips of the same size in the Marina. Boat Central is not economically viable and sets a dangerous precedence for building a 100-foot structure out over the harbor. The real issue to consider is not whether it will fail, but what will the County do with this hulking monstrosity once it does fail? It’s time to re-think this project and use this land for improved public boater access based upon current boater needs and requirements. I agree with the over development objections and oppose the stacked storage. A fish cleaning station is a better addition. The stack storage hours would conflict with fishing by its operating hrs causing delays to fishermen to get to boating destinations for pre dawn fishing. There are times when a gray light bite is the only opportunity for catching a target fish like Sea Bass. 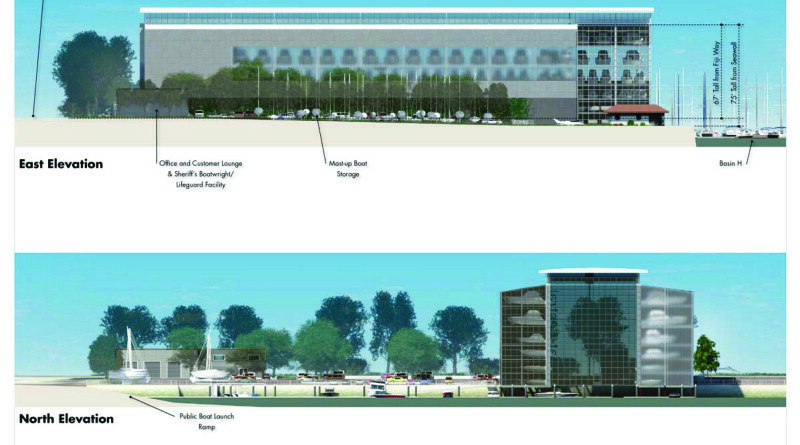 The USACE is NOtT proposing to build the BoT Central project. It is charged with review of the impacts of this project for its impacts on the Public Interest, in conjunction with a permit application for construction of the project elements that fall within Federal jurisdiction (in and over the wTer). Dry stack boat may be a good solution for MdR, but 350 ultra-luxe slots for powerboats staging immediately adjacent to the Public Launch Ramp is a recipe for unpleasant and potentially disastrous boating outcomes. Not to mention the impact of a solid wall over 300′ long and 70′ high upwind of, and nearly perpendicular to, the prevailing wind in the harbor. The location of this Boat Rack type business could easily be in one of the other water side locations. The tight impact to the Launch Ramp and the Sheriff boats is a big issue that the USACE must address. The smaller gap and lack of turning radius is a serious issue. Flow of traffic out of the marina is the USACE domain. They need to really think through the activity of the boats. With a boat tied to the end of the launch ramp and tied to the side of the new proposed docks there will be scarcely room for the Sheriff boat to get out. Least of all if there are wind issues or a emergency. As a long time boater in MDR I like the idea of more facilities for small boaters to get into and out of Marina Del Rey. But the economy of the community has changed. Few have room in their driveway for a boat. And if you keep your small boat in the new “Boat Central” rack you can not make a change and launch at the location closest to the fishing or play you are craving. And once you place your boat in the rack… Then what do you do with the trailer? MDR has lost it’s small boat service location at SeaMark (end of G) to a new Trader Joes. And the other service vendor Regency Boats who used to pick up small boats at the launch ramp is moving away for cheaper rents. How will small boaters keep access to Marina Del Rey? I’m not sure. But with the scares of moving the Launch Ramp and now here with this big boxy boat house to crowd the end of the channel it will be less and less welcoming. I look at the plans. I wonder where the autos with trailers attached will park. I think the loss of the vital last free parking of MDR now used to take people out on Whale Watching tours or affordable fishing trips on the New Del Mar and the Betty-O will be a terrible loss. That last free parking in the marina is serving a vital key in helping people affordably reach the Santa Monica Bay and the Ocean.